Are you experiencing tension and stress? Do you have stubborn knots but massages tend to be too rough for you? Trained in a variety of modalities, Thia has the ability to manipulate fascia, understand the root of your tension, all while keeping you in a tranquil state. By being pulled into such a deep relaxation, your nervous system has a chance to switch over to parasympathetic mode where your body begins to regenerate and heal itself. If you’ve experienced any sort of trauma that lead to chronic pain, headaches, stiffness, or depression, a massage by Thia might be perfect for you. Sometimes you just need to feel the tension leave your body. Through trigger point therapy, stretching, and detailed massage, Aimee’s deep tissue treatment will do just that. By paying attention to your breathing, you will feel your knots being worked out without causing any extreme pain or discomfort. Whether you have sports injuries, chronic pain, or decreased range of motion, sports massage therapy can leave you feeling rejuvenated, spry, and ready to take on the day. Break down adhesions and realign deeper layers of muscle and connective tissue via deep targeted pressure. (includes warm up time to relax before we dig in. 90 minutes is best for full body, 30 and 60 minutes are good for targeting specific areas of tension). Includes hot towel and aromatherapy. All services include aromatherapy. For no additional charge, hot stones, cold packs & facial stones are available upon request or may be suggested for use during your session. Enhance your massage experience by adding these services into your existing massage. Moist heat seeps into your muscles relaxing the tissue and making them more pliable. Hot Towel Therapy increases the body’s ability to let go of soreness and trigger points (knots). Taking advantage of hot towels allows the therapist to get deeper into the issues and increases the benefits of massage. Focused application of organic, high grade hemp extract along the spine, head, and neck. The oil is absorbed by the skin and works with your body's natural Cannabinoid Receptors to help reduce pain and inflammation, and induce calm. This oil therapy will take you through a process of relaxation and rejuvenation. 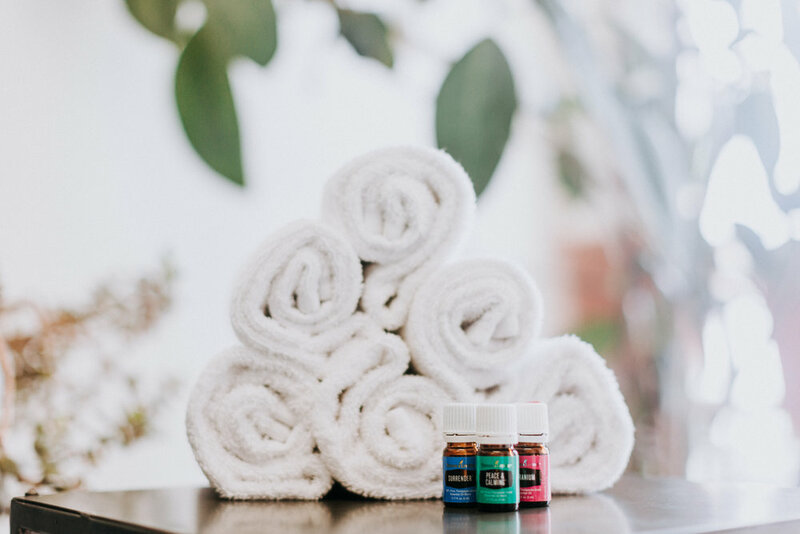 Throughout the massage, the therapist will intermittently use a few drops from the desired blend and let you inhale deeply invoking a chemical-emotional reaction in the body. Have allergies? We can use a blend for clearing sinus pressure or headaches.